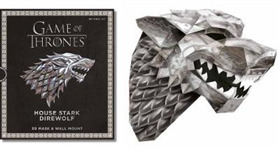 Honour the noble houses of Westeros, and warn others of the coming winter with the official Game of Thrones 3D Mask & Wall Mount series. 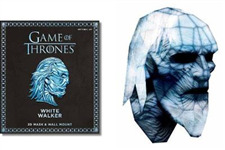 Using Wintercroft's fantastic 3D mask designs, take this iconic monster and create easy-to-make masks either to wear, or to mount on your wall as trophies. This volume in Collins & Brown's bestselling Ultimate series reveals all the techniques you need to begin making beautiful projects with paper. 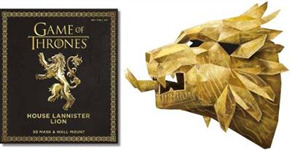 The book covers all the basic papercraft techniques, many of which can be achieved using only paper, scissors and glue. This collection of 12 Lilliputian size models for a total of 69 colourful planes includes the Saber, Skyhawk, Talon, Gargoyle, and Dragonfly. 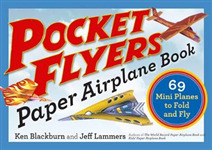 The book includes easy to follow folding instructions for each model, as well as tips on how to fly smaller aircraft. A full-size 3D mask, that uses the official house sigil and is easily assembled to create a full-head mask. It also lets you assemble the wall mount and display it proudly on the wall as a glorious trophy. 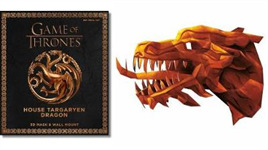 It is suitable for any Game of Thrones fan's home. A full size 3D mask that uses the official house sigil and is easily assembled to create a full-head mask. It can also be assembled and wall mounted to be displayed as a glorious trophy. 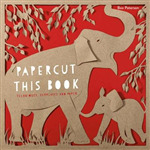 Papercutting artist Boo Paterson shows you step-by-step how to craft your own intricate rainforests, jungles and the critters that live in them in this easy-to-follow, illustrative book. Learn how to cut and bring to life a variety of animals, from tigers to sloths, kangaroos to orangutans.